Assisting Hands Home Care provides memory care services for seniors suffering from Alzheimer’s disease and other forms of dementia in Lombard, Villa Park, Elmhurst, Addison, IL and surrounding areas in DuPage county. Those who are affected by Alzheimer’s disease and dementia are much better off receiving care in the familiar and comfortable environment of their homes. Our caregivers at Assisting Hands have the training and experience to provide excellent memory care for those suffering from these conditions. We can engage your loved ones in memory care exercises that will help reduce the effects of memory loss and we can help counteract mood swings and agitation with positive reinforcement. Dementia is a term that describes a series of symptoms involving the decline in cognitive ability and memory loss. According to Alzheimer’s Association, there are 5.5 million Americans over the age of 65 who are affected by some form of dementia, and 70 percent of those affected by dementia are suffering from Alzheimer’s disease in particular. Alzheimer’s disease is the most common type of dementia and a leading cause of death among seniors in the U.S.
All forms of dementia, including Alzheimer’s disease, are degenerative conditions that impair memory and cognitive abilities over time. Those in the early stages of these conditions may have simple lapses in memory, but they will soon forget friends and family members and lose their general awareness. As the conditions progress, those affected will no longer be able to take care of themselves. Assisting Hand provides in-home memory care services for your loved ones affected by Alzheimer’s disease and other forms of dementia in Lombard, Villa Park, Elmhurst, Addison, IL and surrounding areas in DuPage County, IL. Senior citizens often experience some degree of memory loss that may not be indicative of Alzheimer’s or dementia. Those in the early stages of these conditions often exhibit more severe symptoms than just occasional lapses in memory. Make sure you check for the early signs of dementia and Alzheimer’s disease among your elderly loved ones, especially if there is a family history of these conditions. You can ensure that your loved ones get the proper care to manage their symptoms if you catch it early. Forgetfulness: Those who suffer from these conditions experience issues with their short-term memory first. If the lapses in memory are frequent, this could be a sign of Alzheimer’s or dementia. The lapses in memory may be trivial at first as they forget where they put their jacket, but they will soon forget those closest to them. Wandering: Those affected by dementia wander often because they are in a general state of confusion. They commonly wander looking for things or people that may no longer exist. Agitation: Dementia and Alzheimer’s can lead to agitation and mood swings as those affected can sense their cognitive limitations and grow frustrated. Incontinence: Those in the later stages of Alzheimer’s and dementia lose control of their bodies which can lead to incontinence and other issues. Families may have difficulty caring for loved ones affected by Alzheimer’s disease and dementia because those affected need consistent, specialized care. Our caregivers at Assisting Hands are specially trained to provide effective memory care services for those affected by these conditions. We will help guide your loved ones through the home and keep them safe when they begin to wander, and we will also help temper outbursts of agitation and mood swings. Our caregivers can even help slow the effects of memory loss by engaging with your loved ones in mentally stimulating activities. Companionship: Those who are affected by Alzheimer’s or dementia can benefit from social companionship. Our caregivers will build a personal connection with your loved ones and engage with them in their favorite activities. This will help stabilize their moods and slow memory loss through mental stimulation. Personal Care: Our caregivers will provide assistance with activities of daily living including help using the restroom, bathing, getting dressed, and incontinence care. Wandering: If your loved ones tend to wander, we will make sure they are safe by guiding them through the home and making sure they do not leave the home. Medication Reminders: We will make sure that your loved ones take the correct dosage of their medication at the right times. Meal Preparation: Those affected by Alzheimer’s or dementia may forget to eat and it is dangerous for them to prepare their own meals. We will take care of the meal preparation to ensure that they get enough nutrition. When you call Assisting Hands for memory care services, we will send a member of our staff to the home of your loved one for an in-home evaluation. During this evaluation, we will assess the care needs of your loved ones and do a safety evaluation of the home. The care plan is then created with your input and these plans are flexible so they can be changed as the disease progresses. Make sure you call Assisting Hands Home Care at (630) 313-6160 if you have a loved one in Lombard, Villa Park, Elmhurst, Addison, IL and surrounding areas in DuPage County, IL suffering from Alzheimer’s disease or dementia. Our experienced caregivers will ensure that they get the care they need to live safely at home. 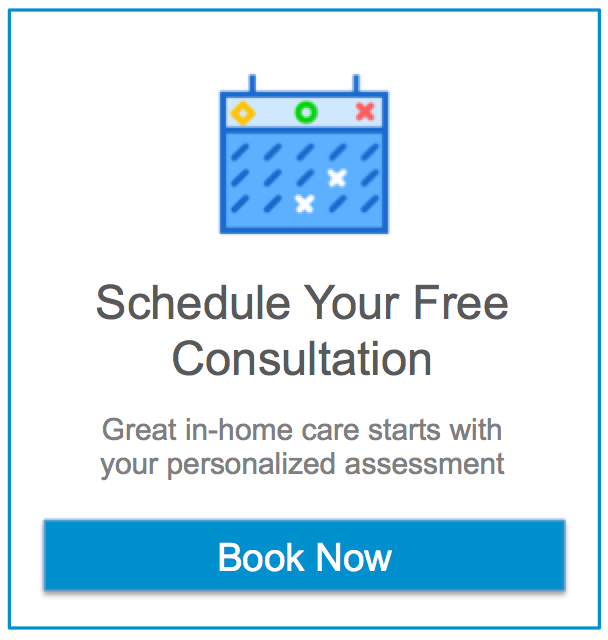 Call us now for a free in-home evaluation.